When You Listen “It” Listens Back. Thoughts on developing the LAB for children in Hailuoto, Finland; or, an attempt to formulate chaos in process. I was 30 years old when I learned about John Cage. Sometimes I imagine that a teacher in elementary school had introduced me to his work. Perhaps my life would have been significantly different, more meaningful, earlier. But there was no such teacher. The argument = absolutely true: when you listen — “it” listens back. In my experience, when you listen to children, they listen back. I first noticed this with my own child. I never disrespected what my daughter had to say, no matter how small, wrong or basic it was, and I observed that I earned the same respect from her. This is such a simple notion. By practicing listening you teach an essential skill: you embody sensitivity, build sensibility towards your environment, and eventually instill the ability to care. Listening is one of the most fundamental things we do. Possibly more important than we realize or are taught to respect. 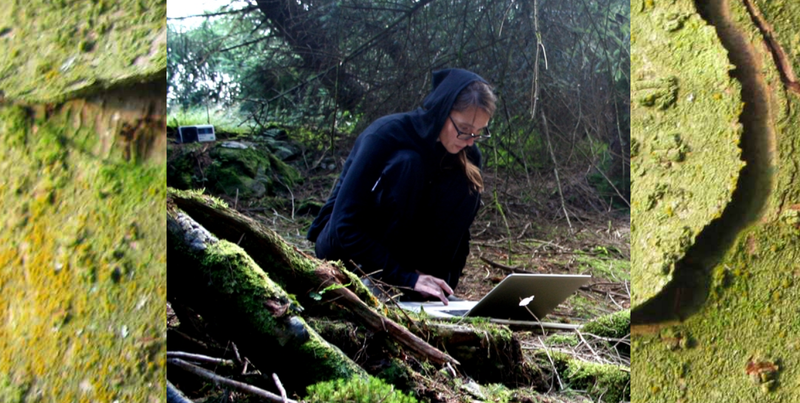 In 2011 I founded the arts organization Hai Art, with an emphasis on sound in public and social space, on the remote island of Hailuoto in northern Finland — a country where, at this point in time, sound art was not widely recognized, respected, or even seen as a thing. Having received an arts grant from the European Rural Agricultural Fund we organized a conference ‘Wind As Context’, 10 artist-in-residencies, and developed a sound- focused children’s program for the island. The work with children was never theorized. This is the first time I have made an attempt to write about it and formulate my intentions. I am going to ‘tell the tale’ of our island village, from the perspective of developing our media LAB, which transformed into a makers LAB. This article contains my observations, path and thought process throughout this very hands-on DIWO (Do It With Others) - experimental off-education (organized education outside of government and other controlled institutions) process. In the beginning was a silence, or rather a constant wind. I find that 6-year-olds are magnificent listeners. In 2012 I undertook a series of listening sessions with pre-schoolers. With prepared field recordings I asked them to close their eyes and listen back to lions, wind, leaves and mosquitoes, and their auditory observations were correct and sharp. We carried on re-making these sounds, such as wind and lions, with our voices. Young children are also the most fearless imitators of sound I have encountered. Using a simple sound editor called Amadeus Pro, we went on to examine the audio wave forms of the sounds we were hearing, then reversed, looped and edited them. In the past I have taught audio editing to adults; I couldn’t help noticing that with these random 6-year-olds, their speed, power of comprehension and readiness of mind was significantly superior to any adult I have worked with. The following experiences of my work with children confirmed this. 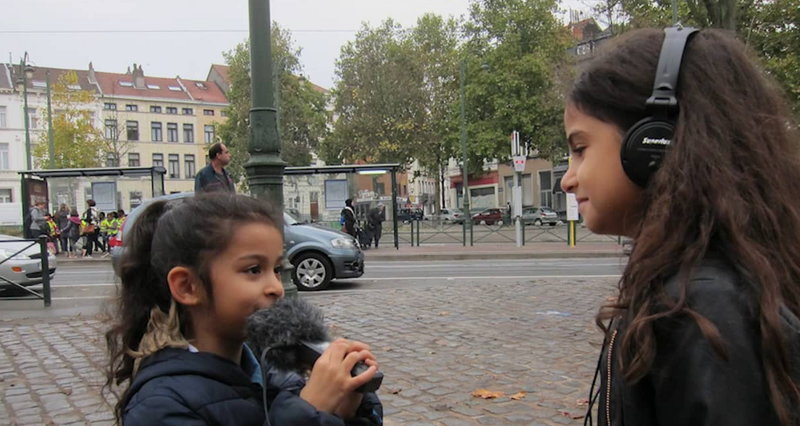 In 2012, Hai Art took part in a project called “The City Rings”, an international sound pedagogy project initiated by Aifoon (BE), MTG/ Sons de Barcelona (SP) and Sound & Music (UK), developed and programmed within the framework of “Sounds of Europe”. Hai Art participated alongside a London elementary school and a school from Braga, Portugal. Workshops were held simultaneously across these schools in different European countries. The aim was to encourage children in school environments to exchange experiences about their locations while operating and studying the medium of sound. During these workshops, pupils were introduced to creative ways of listening, audio recording, audio editing and electronic sound composition. Another significant part was listening to the ‘other’ — similar people from different parts of Europe. Surely the differences between our island of Hailuoto and the school in London especially could have not been bigger, but as we were listening to each other we discovered similarities. Our local elementary school and art teacher had agreed to conduct the 6-week workshop with a class of 5th-graders. The first lesson involved listening to the immediate environment. Quietly, we concentrated on the room and the sounds of the school, and comprehended the constant noise pollution of air conditioning (AC) in the classroom. I introduced different types of field recorders: a TASCAM DR-1, Zoom H4n and a Roland R-05, and their handling. While some children were shy around technology, operation of these devices was easy for everyone. We realized that all the recordings in the school would contain the AC sound, and we tested the sounds of our clothes and how loud any tiny noise can appear on a recording. We worked on the awareness of sound. We discussed audio recording in general and what parameters to consider: loudness, leveling, microphone techniques, direction and so on. I taught in English, and the teacher translated. We recorded the sounds of various ordinary bits and pieces, along with school items, which made us realize the sonic possibilities of everyday objects. But even those little things created wonderful sounds to begin with — beautiful and percussive! We immediately thought to compose beats out of those sounds. 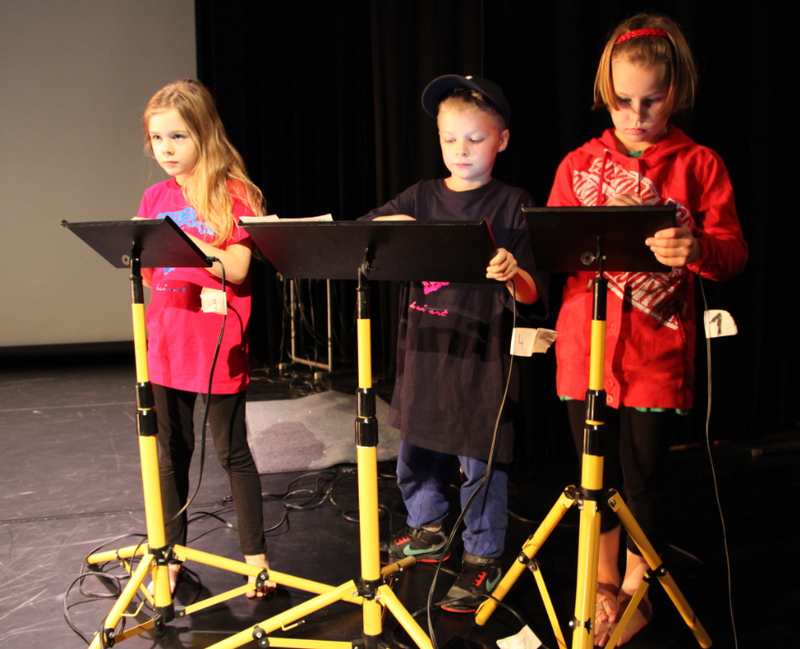 The sounds and compositions were exchanged among the 3 schools using the sound-sharing website Freesound2. The recordings became a basis for reflection and sound appreciation, as well as forming material for new exercises. Composing with self-recorded sounds resulted in a deeper understanding of how electronic music is made. We were also very excited to compose with the sounds from the partner schools. We hooked up two laptops with Radial, a MAX — (audio-visual software created by Cycling74) based looper, and one with Logic Pro and a MIDI controller, created sample instruments with all the sounds, then played them and recorded the results. We also recorded shouted Finnish words to spice up our creations. As we listened collectively to the compositions that the other schools had made, we also discussed them. We were so 95 curious as to how the single sounds had been used by them! We tried to describe what we heard with different words. ‘Busy’, ‘distinctive’, ‘strange’, ‘modern’ and ‘music-like’ were the words the children used. The results were very creative. Antye had shown us before how to use the recorders. 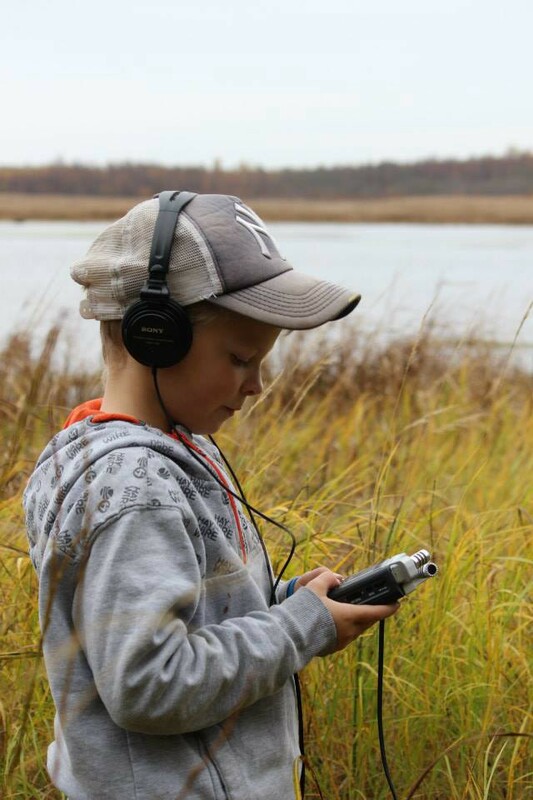 In Hailuoto it is often windy like today so the cap for microphones is needed when recording outside. We went to hunt for sounds around the school and recorded them. Then we listened to the sounds together. Our recordings weren’t qualitatively good: sometimes sounds were too loud, sometimes too quiet. We need to learn more about the sensitivity and be more careful when we are recording. For example it is important how close we are to the sound source. Birds were singing like crazy but they were so far away and the recordings turned out to be very quiet. Sometimes there are so many unwanted sounds around which disturb the recordings. In Hailuoto they are demolishing our secondary school building and the crashing sounds are everywhere! But those sounds are also really interesting!! Crash, boom, bang!! After I had worked with children in the school and kindergarten for about a year, and also utilized the local youth club to teach them (by request of some of the teenagers) how to write music (like Skrillex) with software, I came to realize that we needed a place we could all access, and store the equipment in the village. I discussed sharing spaces with a few local organizations, but eventually decided to rent an old, empty cafe space in the center of the village between the supermarket and the bank to establish a media laboratory. It was an exciting day for me to open ‘the LAB’; it had the vibe of an urban practice, but would it work as well in a rural area? At the time, I felt that the children on the island grew up in a paradise, with nature and animals but also lacked access to technology and technological education. I wanted to share my knowledge, but was also curious about that particular mix — a life close to nature and technology, something I, as an artist, had chosen for myself. With our ongoing grant I equipped the LAB with speakers, a MacBook Pro with Logic, six iPad 2s, field recorders and a lot of ‘leftover’ personal equipment from my partner and I, who are both electronic musicians: MIDI controllers, drum machines, FX devices, a mixing desk, cables. Tablets were just becoming more widely used by the general public and, like many others, I recognized the educational dimension of them without knowing exactly how smart devices impact on learning. I am very aware of the corporate and imperialistic implications devices such as i-devices carry, so I also insist on education about the technologies behind them. Children carry smartphones around, and I find it even more important to teach the handling, aesthetics and ethics of these powerful mini-computers and their software applications. I strongly suggest adults are responsible for informing children about the depth of technology we are collectively exposed to. In fact I believe we have to make a very strong effort. We have to teach them something nobody ever taught us, something that is made apparent every day. Issues like privacy, for instance, are updated daily, and our children are immediately affected. This is happening right now. The teaching must evolve into a new, real-time education method, as we experience new developments simultaneously together with the young child, who comprehends faster and has more time than adults. We need to add a form of understanding, a political and philosophical dimension; we need to develop standards to employ in these fast-changing times. Perhaps we cannot wait for new generations of teachers to be educated. We have to be awake. We started to open a music LAB once a week, and a pre-school LAB every semester. In the beginning, for a year at least, we only made music. I spent weeks researching the best apps for music making. Hai Art now owns about 100 music apps, which most of the children have tested at some point. The curation or framework of the activities was determined by the selection of technology and applications. The apps ARE the curation. a language I only partly understood (being German). I would jump from one to another and admire, listen, correct, help or be helped. It was a wonderful, crazy, fun and very demanding time. At the end of the day we all made music together! What does that mean? I founded the iPad Orchestra in 2012. After conducting numerous workshops in loose groups I realized the potential of collaborating almost wordlessly through music. 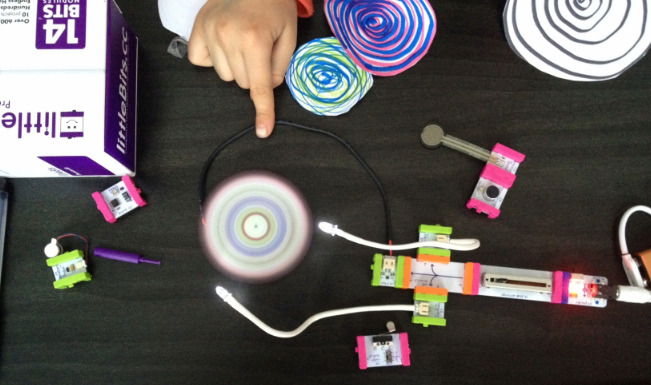 We started to build small teams of 2–4 children and make music together. We approached it in a similar way to how a band might make a song: one child would play beats, another one a melody, another noises, and one perhaps the bass. Never that strict, we used apps like iMPC, Launchpad, RealBeat, Singing Fingers, PixelWave, Sylo Synth, Soundrop, Dubpad, Synthmate… the list goes on. Workshop leaders started to help compose complete pieces, and we prepared for performances. We built bright yellow iPad stands with the local metalworker. After practicing now for three years we have played 10 concerts and written many songs to be performed with apps. 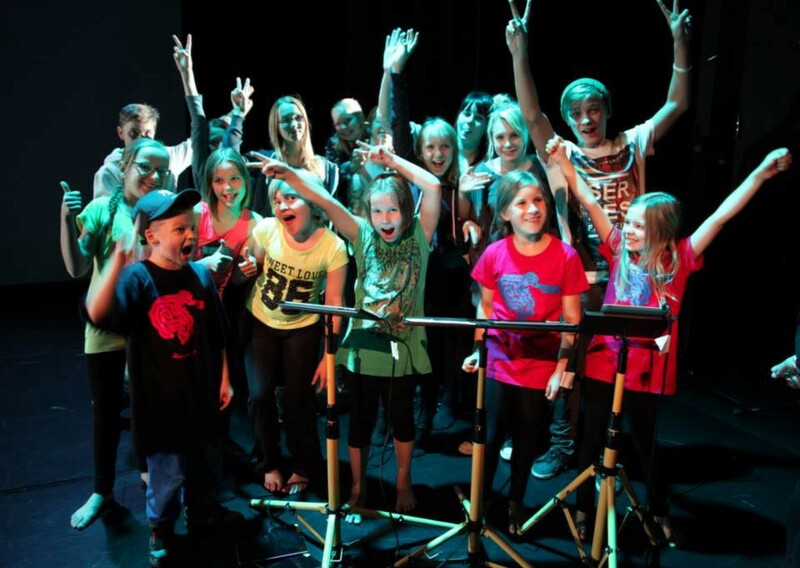 Last year we performed at a children’s film festival gala in the closest big city, Oulu, and the success was liberating. A small youth club from a rural area was asked to come and play a major show! It was awesome! We couldn’t be more proud. I appreciate the simplicity and instant results which these musical instruments help to achieve. Apps are (often) good in performing one simple task very well. I do not expect any of these children ever to be musicians; in fact I hope they don’t. I hope they learn principles they can use in all areas of practice. The aim is to engage with an abstract form of expression which is not chiefly occupied by existing opinions and rules. This is liberating and, I think, a great life-lesson. You do something with passion, with others, and you succeed. I am hoping to instill this method of trust, which builds confidence for life. Contrary to classical music education, where there is usually a predetermined goal such as to play a composition of Mozart’s well, there is no goal except encouraging confidence. This year we plan to publish a CD. Over time the LAB evolved. After a successful concert with the iPad Orchestra I rewarded the teams and introduced gaming to the LAB by buying two games: Minecraft and Monument Valley. 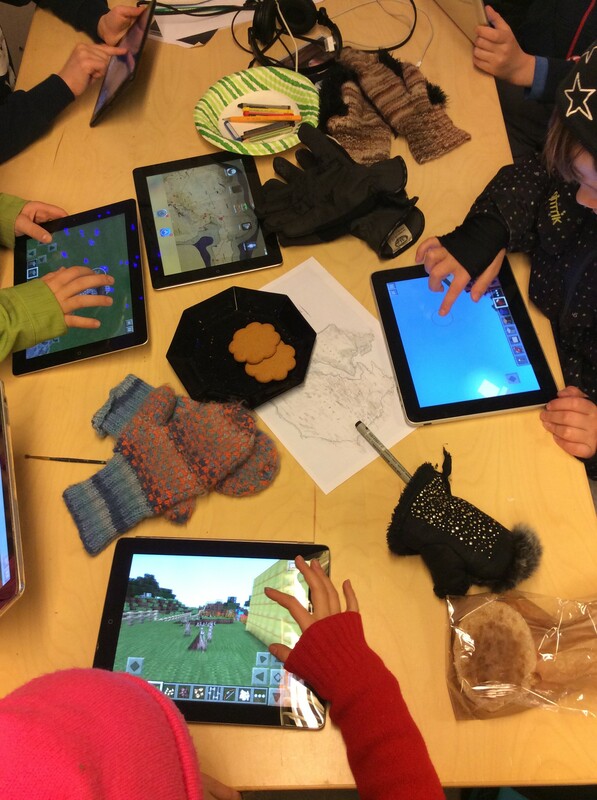 The educational process for understanding the magic and dangers of Minecraft was quite a procedure, but eventually we established our own server and built worlds in it. We established rules in the LAB such as ‘Minecraft: only Creative mode’, and also ‘NO CANDY’. I made the most curious observations in terms of gender stereotypes: while all the boys played Minecraft and had to be encouraged and guided to play Monument Valley, the opposite was true for the girls. While Minecraft has no default female character, the Monument Valley character is female. At this point, if the reader does not know these games, it is worth updating yourself, because the generation being raised right now will be the Minecraft generation. As yet, we have no idea what that means. Other very nice games we started using are, for instance: Feed the Head, Windosill, The Human Body, Toca Lab, Contre Jour, Clumsy Ninja, Math Evolve, Plants and Kiwanuka. Dedicated research and networking are necessary to separate the meaningless games from the meaningful. I introduced different forms of coding via small apps such as Scratch, Processing, Codecademy and Tynker, and visual coding also via Processing. Some of the children were very keen on manipulating sketches; one boy made a sketch which he used to perform with his iPad band. Over time, some of the children expressed interest in building computers. First we used an old Mac to test different operating systems, until we finally bought a Raspberry Pi 2 and built it together with a small team. We also made a Finnish-language documentary with a 12-year-old host, who explains the Raspberry Pi as an affordable, flexible and useful computer. Hai Art employed other workshop leaders, and older children for summer jobs. Tiina Sainila initiated a dance section, and a volunteer started a computer hardware LAB. This year we bought the flexible electronic construction set littleBits and held an extensive street art and graffiti workshop. Increasingly diverse things began to happen with the new workshop leaders. In summer 2014 our new LAB-master Tiina Lapola started an outdoor LAB, where we would meet at the LAB, take field recorders, mobile devices, cameras, little battery-powered speakers and cut-up vegetables for snacks, then take bicycle trips to local nature points. These trips turned out to be so important and interesting. For the last year we have had the LAB open every day for about 2 hours after school. We established a YouTube channel: Growing up in #Hailuoto, and many more activities. One thing I grew very suspicious of is: why are children not taught computer code language in schools? Is it some planned manipulation by the government to make sure they don’t grow smarter than them? I ask myself, how responsible is a society which does not teach the basic languages that run the devices we are all absolutely dependent on at every instant? Out of this void I developed the idea to build our own sound app together and make a comprehensive project about the code, design, content, ideas, aesthetics and processes behind the commercial surface of these devices that all children play with. Hai Art invited the Mexican-born, Aalto University Helsinki student, sound and code artist Juan Carlos Duarte Regino to the island to develop our own sound application for iPads, in order to mark our gender-equal, socially diverse sound ensemble, the iPad Orchestra. The aim was the development of one functional sound app resulting from collaborative design among the Hai Art community. Once again we asked the local elementary school about collaboration and received permission to ask all pupils to design a sound app of their own on paper during art clas. Then we invited the art director of a nearby gaming company to make a presentation about its work and give examples of how games and applications are made. The scope of activities spanned from designing imaginary apps, revising and producing the ideas, taking design and interface development workshops, building working groups, then producing a sound or music iPad app via iOS development based on openFrameworks and the ofxPd library. We went to the school 2–3 times a week for about 2–3 hours and developed the ideas further. Firstly, we had a meeting with the teachers and the school principal. Then I briefed all the classes and asked each child to design and invent an imagined (sound) app on paper. We met a week later and revised the results together. One week we employed a graphic designer to prepare an introduction to the principles of design. Then we assembled a working group with children who wanted to participate in making the app –around 25 of them. The working group met with Juan, the artist who introduced sound app development and the code used. 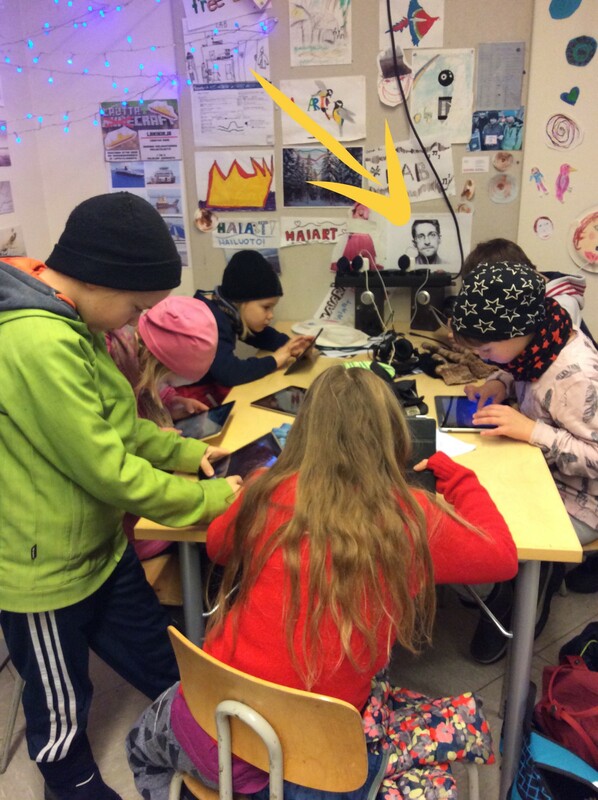 As a reward for children who had participated in the workshops, we organized a trip to the nearby game company LudoCraft in Oulu. 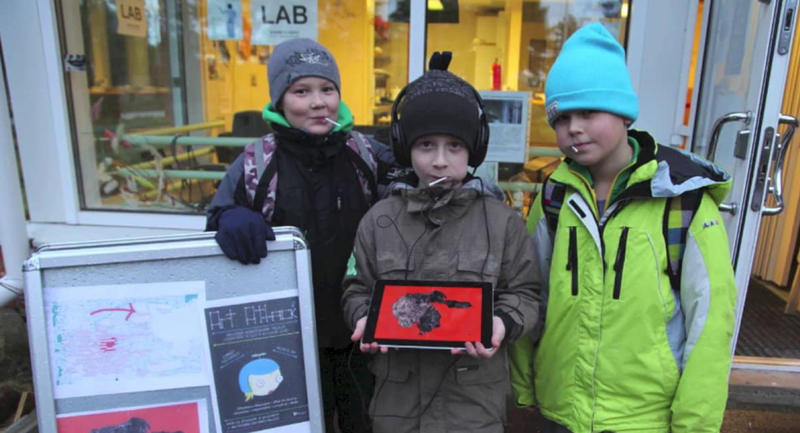 We built a prototype of Sound Map Hailuoto in MobMuPlat and presented it to the school. After the summer break we developed the app with the artist in order to release it via the App Store for iPad and 97 iPhone. The app is a visual presentation of our island, and the sounds are field recordings from workshops with children and sound art camp participants. Some sounds are derived from public space artworks such as the Sonic Bikes (Kaffe Matthews), Pulsar Kite (Juan Duarte Regino) or the Xylophon-Marble-Instrument-Movement (Children of Hailuoto). All of the sounds can be found in Hailuoto. The user of the app has to stroke the island and can listen to our environment. My work with children has primarily been intuitive. Through observation, my colleagues and I engage with the children on the island. I conclude that while working with children I experience evolution – I see that they have faster brains and a greater breath of understanding of most of the items we all encounter as ’new things‘, such as pocket computers. Yet I also see a void. My question is then, how do we take the responsibility for raising children in our time? What roles do society, education and parenting play? How do we teach universal ethics, independent from religion, nationality and other values that divide humans? Essentially, everybody has to work together as openly and inclusively as possible to face these challenges; how are these things discussed, and who decides what a curriculum should deliver? In my opinion, the classic model of education cannot cope with the speed of the world as it is developing; it is absolutely essential that spaces exist where other forms of education are practised in a free form, better adjusted to our age of constant change, rapid development and so on. Flexible attentive learning. While I have no doubt that children will grow into being able to master technologies, I do worry about the politics of the devices they use, and the underlying power structures which shape their paths. For instance, consider the internet. Why are we not learning more deeply and broadly about the internet? In my opinion there is a fundamental lack of responsibility and too much trust placed in corporate hands. I came to realize that children are perfect people. And I still keep asking myself: how did we end up becoming what we are? When did it begin that we were so scared, so conformist, and so inactive about the essential issues we should be fighting for? This article was commissioned and originally published in the glissando magazine #27/2015 under ‘Technologies and Music Education in Central-Northern Europe’. 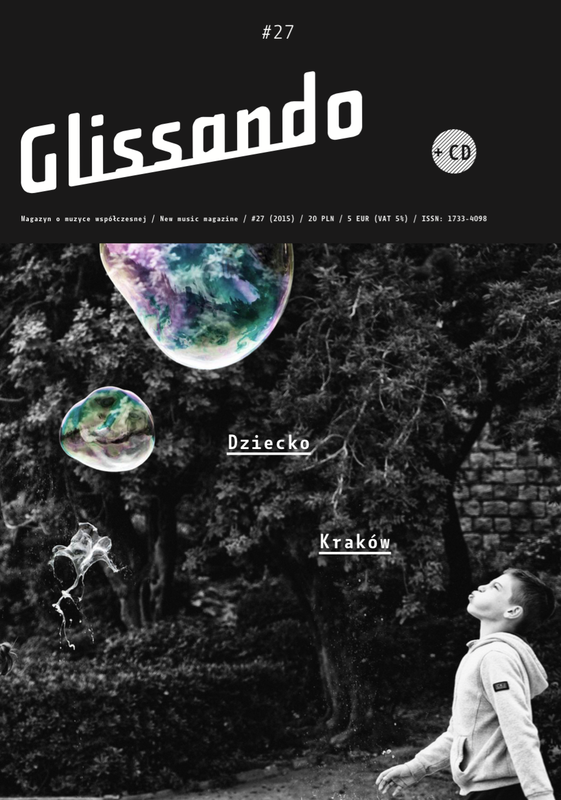 Thanks to the glissando team.